Today, September 29, is Michaelmas, the feast of the Archangel Michael. Although Michaelmas is primarily a Christian festival to celebrate the end of the harvest, Michael, the Archangel the day is named after, is honoured by followers of many spiritual paths and magical traditions, so I am happy to call this day The Bad Witch's Festival of the Week. According to A Dictionary of Angels by Gustav Davidson, Archangel Michael is "the greatest of all angels, whether in Jewish, Christian, or Islamic writings, secular or religious". Davidson goes on to say that originally Michael was worshipped as a god in his own right, by the Chaldeans , although now he is considered the leader of the host of angels, a warrior who defeated Lucifer in the war in heaven and who stands for mercy, repentance and battle against the forces of darkness. In ceremonial magic Archangel Michael can be called upon for protection. Associated with the element of fire, he is one of the guardians of the compass points of the circle, along with Raphael, Gabriel and Uriel. 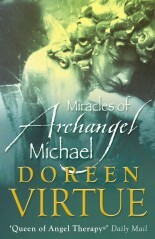 According to New Age angel expert Doreen Virtue in her book The Miracles of Archangel Michael: "Michael brings pure messages of love, wisdom, and power, directly from the Creator." She says Michael will help anyone who asks him, regardless of their background or faith. Whether or not you think you need a little angelic help in your life today, you could still celebrate Michaelmas in style and have a slap-up harvest feast - although you might not feel like going to the bother of cooking goose, which was the traditional Michaelmas day fare. Michaelmas is also supposedly the last day of the year you should eat blackberries. According to legend, when Michael banished Lucifer from heaven on this day, the fallen angel tumbled into a blackberry bush. He is apparently still so angry about it that he goes around peeing on all the blackberry bushes on every anniversary of his downfall.